A Community Consultation Session will be held on April 13, 2017 to address the application regarding 153 Dufferin Street. The proposal is to erect and display one illuminated third party electronic ground sign, containing one sign face measuring 8.53 metres vertically by 17.07 metres horizontally and at an overall height of 22.86 metres above grade at the easterly portion of the property adjacent to the existing warehouse building and directed towards the F.G. Gardiner Expressway. The single face on the sign is proposed to display electronic static copy. Also contemplated is the removal of an existing third party roof sign at the subject premises and extending the expiration provisions for third party signs from 5 years to 10 years. The Session will be held at the Parkdale United Church (171 Dunn Avenue – southeast corner of Dunn Avenue and King Street West) commencing at 7:30pm. The feedback City Staff receive through the Community Consultation Session will help inform the staff report and recommendations, scheduled to be before PGMC on May 31st. Everyone is invited to attend and participate in shaping their neighbourhood. Twelve youth from the Ward 14 Youth Advisory Council partnered with Greenest City for two cooking initiative workshops at Masaryk Cowan Community Centre. In addition, the Ward 14 Youth Mechanic program had six youth trained in repairing and rebuilding bicycles for themselves and community members. Great work Masaryk Cowan! The Centre for Connected Communities has created a new leadership program, Local Champions! This exciting, interactive curriculum offers you tools you can use in your neighbourhood and in your life! Open to residents from Toronto’s NIA’s and Emerging Neighbourhoods, the Local Champions project is designed to bring residents who have demonstrated their local leadership to the next level, to honour their expertise, and build upon it in ways that propel their communities forward. The City of Toronto is launching Phase 2 of its public consultation on the renewal of its Long-Term Financial Plan. Information about the consultation, including background reports and engagement opportunities, a public workshop and an upcoming online survey, is available at http://www.investinginTO.ca/. The public is also invited to participate in the conversation on social media, using the hashtag #InvestinginTO. For the second phase of consultation, the City is inviting members of the public to City Hall for a conversation about how it makes decisions and balances priorities that have a long-term financial impact. An interactive afternoon of workshops and discussions will be held at Toronto City Hall, 100 Queen St. W., on Saturday, April 22 from 1 to 5 p.m. The open house will begin at 12:30 p.m.
create a financial path that brings us closer to the city we want. More information about the workshops and discussions is available at http://www.investinginTO.ca/. The workshops will be available via webcast for those who wish to participate online. An online survey will also be open from April 22 to May 14. The first consultation, which took place last fall, focused on how the City manages expenses, raises revenue, and could maximize its assets. The City heard about the need to balance the priorities and budgets while also supporting the most vulnerable Torontonians. The public was also clear about keeping the City’s commitments to innovation, economic health, infrastructure investments and the environment while finding ways to pay for them. The City also heard about the need for information that helps the public understand and contribute to the City’s budgets, plans, and decision making. The findings from the consultation process will provide advice for Council and the City Manager as the City sets out to develop its Long-Term Financial Plan. The plan will guide financial decision-making over the long term and put Toronto on a path to financial sustainability. It will also help address structural financial issues as expenditures continue to rise faster than revenues, and help ensure that the City continues to run well, spends public money wisely, and delivers the programs and services residents need and want over the long term. Inspirations Studio (https://inspirationsstudio.org/) is having a its annual Spring Sale from May 12 -14, 2017 at 2480 Dundas St W.! The City of Toronto is considering regulations for short-term rental of accommodation in Toronto and is inviting members of the public to share their views at meetings on March 28 and April 12. Residents will also be able to fill out an online survey to provide their views on the proposed regulations. The term “short-term rental” typically describes rentals that occur over a period of less than 30 days. Popular online platforms such as Airbnb, Homeaway and VRBO facilitate bookings and payments for short-term rentals. The first consultation meeting will be held in the council chamber of North York Civic Centre, 5100 Yonge St., from 6:30 to 8:30 p.m. on Tuesday, March 28. The second consultation meeting will be held in Committee Room 2 at City Hall, 100 Queen St. W., from 6:30 to 8:30 p.m. on Wednesday, April 12. Key areas of discussion include quality of life (income/noise/safety), housing availability and affordability, economic development and tourism, and taxation. Live streaming of the April 12 meeting’s proceedings will be available at https://www.youtube.com/channel/UCch85CnI_WEYnicVpC22E0A. A staff report with recommendations is expected to go to the City’s Executive Committee for consideration in June. More information about the review is available at http://www.toronto.ca/mlshaveyoursay and the survey will be available on that web page starting March 28. As part of this year’s infrastructure improvement projects scheduled along the west end of the 501/301 Queen streetcar route, TTC is beginning track reconstruction on The Queensway from Claude Avenue (west of Roncesvalles Avenue) to the Humber Bridge, where the City of Toronto is presently working. The annual candlelight walk is a symbolic gesture in support of climate action. This year two village walks, one west along Queen St. and one south down Roncesvalles Ave. will converge at the intersection of King, Queen, and Roncesvalles. The walk is supported by the Greenest City, the Parkdale Village BIA, the Roncesvalles Village BIA, RoncyWorks, and Climate Action Canada. Councillor Gord Perks, MPP Cheri Di Novo and MP Arif Virani have confirmed they will be in attendance and are invited to address the crowd briefly. 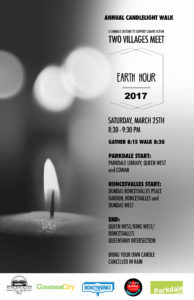 GOAL – this year, Earth Hour 2017 Walk will be used to kickstart a deeper commitment to local action with the founding of Green14, a green neighbours group for Ward 14. Green Neighbours groups have been set up in several other City of Toronto wards for the purpose of education and engaging residents about climate action strategies. Bring your own candle. The walk will be cancelled if it rains. Acclaimed author and native plant advocate Lorraine Johnson will present ways to connect gardens with High Park by growing native plants, and best practices for successful gardening. Lorraine Johnson is the author of numerous books on environmental issues and gardening. Former president of the North American Native Plant Society, her areas of expertise include gardening with native plants, urban agriculture, biodiversity conservation, and urban forest protection. Municipal Licensing and Standards and City Planning divisions are inviting residents to have their say about short-term rentals at upcoming consultations and/or via an online survey. The term “short-term rental” typically describes rentals that occur over a short period of time (e.g. less than 30 days). Popular online platforms, such as Airbnb, Flipkey, Homeaway, VRBO, and Roomorama facilitate bookings and payments for short-term rentals. A final report, with recommendations is expected at Executive Committee in June.